Cumberbatch at the premiere o 12 Years a Slave at the 2013 Toronto Internaitional Film Festival. 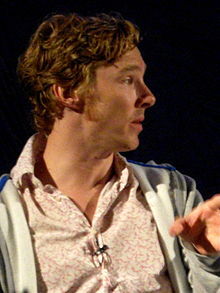 Benedict Timothy Carlton Cumberbatch (19 Julie 1976) is an Inglis film, televeesion, theatre an vyce actor. ↑ "Benedict Cumberbatch, Nick Moran And Colin Salmon Star In The SunnyMarch Short Film "LITTLE FAVOUR"". PR Newswire. Retrieved 20 January 2014. ↑ "Howard Jacobson, Benedict Cumberbatch, Zaha Hadid, Colin Firth, Mumford and Sons, Christian Marclay". Front Row. 2010-12-23. BBC Radio 4. Retrieved 2014-01-18. ↑ 4.0 4.1 4.2 4.3 4.4 Natalie Zutter (13 December 2013). "From 'Sherlock' to Smaug: Benedict Cumberbatch's Best Characters From Books". Bookish. Retrieved 9 September 2014. ↑ 5.00 5.01 5.02 5.03 5.04 5.05 5.06 5.07 5.08 5.09 5.10 5.11 5.12 "20 Questions With... Benedict Cumberbatch". Whats On Stage. 25 April 2005. Retrieved 4 September 2014. ↑ 6.0 6.1 Joe Reid (17 May 2013). "Benedict Cumberbatch: 8 Roles Ranked In Order of Creepiness". Tribeca Enterprises. Retrieved 9 September 2014. ↑ "Short Film Festivals: Does Short and Sweet Win The Race?". Lights Film School. Retrieved 9 September 2014. ↑ "Film-maker's debut movie stars Benedict Cumberbatch". Bath Chronicle. ↑ Philip French (8 May 2010). "Four Lions | Film". The Guardian. Retrieved 9 September 2014. ↑ Jana Monji (6 December 2012). "Third Star Review". Roger Ebert. Retrieved 9 September 2014. ↑ "Benedict Cumberbatch: Rising Star". E!. Retrieved 9 September 2014. ↑ 12.0 12.1 12.2 12.3 Euan Ferguson (18 August 2012). "Benedict Cumberbatch: naturally he's a class act". The Guardian. Retrieved 4 September 2014. ↑ Ian Freer (17 June 2010). "Exclusive: War Horse Cast Announced". Empire. Retrieved 4 September 2014. ↑ Peter Bradshaw (15 December 2011). "Wreckers – review". The Guardian. Retrieved 4 September 2014. ↑ Mike Fleming Jr (16 June 2011). "Benedict Cumberbatch To Voice Smaug in 'The Hobbit'". Deadline.com. Retrieved 4 September 2014. ↑ Stefano Lippiello (29 April 2013). "'Girlfriend in a Coma': Film censured by Italy opens in Berlin". Cafe Babel. Retrieved 9 September 2014. ↑ Nikki Finke (4 January 2012). "'Star Trek' Sequel Hires Hot British Actor". Deadline.com. Retrieved 4 September 2014. ↑ Kofi Outlaw (22 August 2014). "'Little Favour' Review". Screen Rant. Retrieved 9 September 2014. ↑ Justin Kroll (31 May 2012). "Cumberbatch joins '12 Years a Slave'". Variety. Retrieved 23 October 2012. ↑ Child, Ben (23 January 2013). "Benedict Cumberbatch as Julian Assange in the WikiLeaks movie – first picture". The Guardian. Retrieved 23 January 2013. ↑ Fleming, Mike. "Benedict Cumberbatch To Voice Smaug in 'The Hobbit'". Deadline. Retrieved 23 October 2012. ↑ "Benedict Cumberbatch in Talks to Join 'August: Osage County' (Exclusive)". The Hollywood Reporter. 23 August 2012. Retrieved 23 October 2012. ↑ Deepanjana Pal (7 March 2014). "August: Osage County: Families are sad even with a singing Cumberbatch". First Post. Retrieved 4 September 2014. ↑ Todd Cunningham (20 May 2014). "DreamWorks Animation Switches Release Dates on 'Penguins of Madagascar' and 'Home'". The Wrap. Retrieved 4 September 2014. ↑ Kit, Borys (4 June 2013). "Keira Knightley to Star Opposite Benedict Cumberbatch in 'Imitation Game'". The Hollywood Reporter. Retrieved 20 September 2013. ↑ 26.0 26.1 Susanna Lazarus (24 July 2014). "Fiery Smaug Dominates First Poster for The Hobbit: The Battle of Five Armies". Radio Times. Retrieved 4 September 2014. ↑ Claire Rutter (25 June 2013). "Benedict Cumberbatch Warned Of Fellow Actors' Jealousy?". Entertainment Wise; Giant Digital. Retrieved 4 September 2014. ↑ Borys Kit (21 May 2014). "Benedict Cumberbatch Replacing Guy Pearce in Johnny Depp's Whitey Bulger Pic". The Hollywood Reporter. Retrieved 4 September 2014. ↑ "Benedict Cumberbatch in Nepal". The Himalayan Times. November 5, 2015. Archived frae the oreeginal on November 5, 2015. Retrieved November 5, 2015. ↑ Lesnick, Silas (March 9, 2015). "Production Officially Begins on Warner Bros.' The Jungle Book". comingsoon.net. Retrieved March 10, 2015. ↑ 31.0 31.1 Fraser McAlpine (22 April 2013). "The Full Dynastic Heritage Of Benedict Cumberbatch". BBC America. Retrieved 4 September 2014. ↑ 32.0 32.1 James Mottram (4 October 2013). "'It's Not Like I've Completely Conqured Everything': Benedict Cumberbatch Interview". The Independent. Retrieved 4 September 2014. ↑ "BBC tackles 'glamorous' spies". BBC. 5 August 2002. Retrieved 4 September 2014. ↑ "Sherlock's Benedict Cumberbatch: I'm not an overnight success". Radio Times. 14 August 2013. Retrieved 9 September 2014. ↑ Judith Welikala (21 August 2013). "Benedict Cumberbatch on playing Stephen Hawking". The Telegraph. Retrieved 4 September 2014. ↑ 36.0 36.1 Mark Lawson (28 April 2008). "Mark Lawson talks to Benedict Cumberbatch about his biggest challenge yet: playing a dad". The Guardian. Retrieved 16 September 2014. ↑ "BBC - Comedy - Broken News About The Show". BBC. Retrieved 9 September 2014. ↑ "Stuart: A Life Backwards - TV adaptation of Alexander Masters' award-winning memoir commences filming". BBC. 9 December 2006. Retrieved 4 September 2014. ↑ "The Last Enemy revealed in new BBC One thriller". BBC. 9 March 2007. Retrieved 4 September 2014. ↑ "Small Island: Benedict Cumberbatch plays Bernard". BBC. 14 October 2009. Retrieved 4 September 2014. ↑ "BBC One – imagine..., Vincent Van Gogh: Painted with Words". BBC. 17 July 2011. Retrieved 23 October 2012. ↑ 42.0 42.1 Matt Tamanini (20 August 2014). "BWW Profile: Benedict Cumberbatch Emmy-Nominated Star of Stage and Screen". Broadway World. Retrieved 4 September 2014. ↑ "The Rattigan Enigma By Benedict Cumberbatch". BBC Four. 2 January 2012. Retrieved 23 October 2012. ↑ Press Office (12 December 2008). "BBC Drama Announces Sherlock, a New Crime Drama for BBC One". BBC. Retrieved 25 March 2013. ↑ Andreeva, Nellie. "HBO Greenlights World War I Mini Starring Benedict Cumberbatch And Rebecca Hall". Deadline.com. Retrieved 23 October 2012. ↑ Dan Snierson (8 February 2013). "'The Simpsons': Watch Benedict Cumberbatch play the British prime minister AND Snape". Entertainment Weekly. Retrieved 9 September 2014. ↑ Aleks Sierz (21 March 2006). "The Stage / Reviews / Period of Adjustment". Thestage.co.uk. Retrieved 25 March 2013. ↑ 49.0 49.1 "News – The definitive guide to London's Off West End theatre scene, featuring listings and details for over 80 theatres, news, discussion and exclusive special offers". OffWestEnd.com. Retrieved 25 March 2013. ↑ "The City at The Royal Court Theatre". Royalcourttheatre.com. 7 June 2008. Retrieved 25 March 2013. ↑ "Children's Monologues". Dramatic Need. Retrieved 23 October 2012. ↑ "Benedict Cumberbatch in Rosencrantz and Guildenstern Are Dead". PBS. 14 February 2014. Retrieved 16 September 2014. ↑ "Benedict Cumberbatch to play Hamlet on stage". BBC. 26 March 2014. Retrieved 4 September 2014. ↑ 54.0 54.1 54.2 "Benedict Cumberbatch at National Theatre". National Theatre. Retrieved 16 September 2014. ↑ "BBC Radio 4 - Saturday Drama, Mike Walker - The Biggest Secret". BBC. June 2004. Retrieved 16 September 2014. ↑ "Book at Bedtime: Le Pere Goriot". BBC. 19 September 2005. Retrieved 13 March 2015. ↑ "Seven Woman – And – The Twelve Pound Look". Radio Listings. Retrieved 16 September 2014. ↑ 58.0 58.1 58.2 58.3 58.4 "Benedict Cumberbatch at Radio Listings". Radio Listings. Retrieved 16 September 2014. ↑ "BBC - Drama on 3 - The Possessed". BBC. 7 May 2006. Retrieved 16 September 2014. ↑ "BBC Radio 4 - 15 Minute Drama, The Pillow Book, Episode 1". BBC. Retrieved 16 September 2014. ↑ "Blake's 7: Jenna - The Trial: The Early Years (Unabridged)". iTunes. 2010. Retrieved 16 September 2014. ↑ "BBC Radio 4 - Afternoon Drama, Nick Warburton - Last Days of Grace". BBC. September 2008. Retrieved 16 September 2014. ↑ "BBC Radio 4 – At War with Wellington Docudrama, Spoils of War". BBC. Retrieved 16 September 2014. ↑ "BBC Radio 3 – Words and Music, Italian Fantasy". BBC. Retrieved 16 September 2014. ↑ 66.0 66.1 "Metamorphosis". Radio Listings. Retrieved 13 March 2015. ↑ "Rumpole And The Penge Bungalow Murders [Afternoon Play/Drama]". Radio Listings. Retrieved 13 March 2015. ↑ "Rumpole And The Family Pride [Afternoon Play/Drama]". Radio Listings. Retrieved 13 March 2015. ↑ "Rumpole And The Eternal Triangle [Afternoon Play/Drama]". Radio Listings. Retrieved 13 March 2015. ↑ "Words for You (The Next Chapter)". iTunes. Retrieved 13 March 2015. ↑ "Afternoon Play – Rumpole and the Man of God". BBC. 1 March 2012. Retrieved 19 October 2012. ↑ "Afternoon Play – Rumpole and the Explosive Evidence". BBC. 2 March 2012. Retrieved 19 October 2012. ↑ "Afternoon Drama, Rumpole, Episode 1". BBC Radio 4. 18 December 2012. Retrieved 25 March 2013. ↑ 8.30–10.00pm (1 January 1970). "Media Centre – Programme Information – Drama On 3: Copenhagen". BBC. Retrieved 25 March 2013. ↑ Jones, Paul (20 February 2013). "Benedict Cumberbatch and the cast of Neverwhere – first photo and air date revealed". Radio Times. Retrieved 25 March 2013. ↑ "Neil Gaiman – Neverwhere". BBC Radio 4. 1 January 1970. Retrieved 25 March 2013. ↑ "Rumpole and the Old Boy Net". BBC. 20 March 2014. Retrieved 13 March 2015. ↑ "Rumpole and the Sleeping Partners". BBC. 21 March 2014. Retrieved 13 March 2015. ↑ "Casanova by Giacomo Casanova". iTunes. Retrieved 16 September 2014. ↑ Lowry, Brian (23 April 2010). "Review: 'Into the Universe With Stephen Hawking'". Variety. Retrieved 23 October 2012. ↑ Brian Lowry (4 August 2011). "Review: 'Curiosity: Did God Create the Universe?'". Variety. Retrieved 16 September 2014. ↑ Cole, Tom (6 September 2012). "Hear Benedict Cumberbatch narrating Stephen Hawking's new documentary series". Radio Times. Retrieved 19 October 2012. ↑ Alice Jones (31 October 2012). "Yo, Sherlock! Benedict Cumberbatch performs spoken-word with Friendly Fires". The Independent. Retrieved 16 September 2014. ↑ Jenn Selby (15 May 2013). "Benedict Cumberbatch to appear on new Röyksopp album". Glamour. Retrieved 16 September 2014. ↑ Tom Eames (24 October 2013). "Benedict Cumberbatch to feature on new 'Late Night Tales' album". Digital Spy. Retrieved 16 September 2014. ↑ Enk, Bryan. "'Jerusalem': Benedict Cumberbatch Narrates Stunning IMAX 3D Documentary". Yahoo!. ↑ Tom Eames (6 May 2014). "Benedict Cumberbatch Reads Final 'Flat of Angles' Short Story". Digital Spy. Retrieved 4 September 2014. ↑ Kate Hodal; Chris Kelly; Felicity Lawrence; Caz Stuart; Thibaut Remy; Irene Baqué; Mary Carson; Maggie O'Kane (10 June 2014). "Globalised Slavery: How Big Supermarkets are Selling Prawns in Supply Chain Fed by Slave Labour". The Guardian. Retrieved 4 September 2014. ↑ Brigid Brown (23 June 2014). "Benedict Cumberbatch Narrates Cristiano Ronaldo Documentary". BBC America. Retrieved 4 September 2014. ↑ "The Nightjar". The 5 Experience website. Retrieved 1 May 2011. ↑ Morgan Jeffery (20 January 2014). "Sherlock: The Network app: 'It's a bit of Cumberbatch in your pocket'". Digital Spy. Retrieved 4 September 2014. ↑ "Ready to swoon? Benedict Cumberbatch is acting his heart out in Quahog. Join him for a spot of tea!". Family Guy: The Quest for Stuff Verified Facebook. 20 January 2014. Retrieved 4 September 2014. This page wis last eeditit on 19 November 2018, at 14:19.